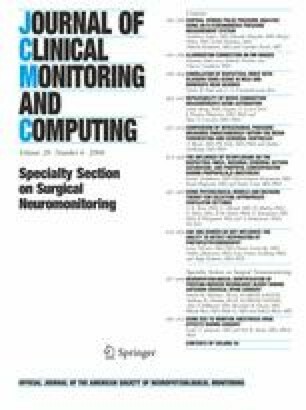 This study was a retrospective review of 3,806 patients who underwent anterior cervical spine surgery with multi-modality neurophysiological monitoring consisting of transcranial electric motor evoked potentials, somatosensory evoked potentials and spontaneous electromyography between 1999–2003. The objectives of this study were twofold: (1) to evaluate the role of transcranial electric motor evoked potential tceMEP and ulnar nerve somatosensory evoked potential (SSEP) monitoring for identifying impending position-related stretch brachial plexopathy, peripheral nerve entrapment/compression or spinal cord compression and (2) to estimate the point-prevalence of impending neurologic injury secondary to surgical positioning effects. Sixty-nine of 3,806 patients (1.8% showed intraoperative evidence of impending neurologic injury secondary to positioning, prompting interventional repositioning of the patient. The brachial plexus was the site of evolving injury in 65% of these 69 cases. Impending brachial plexopathy was most commonly noted immediately following shoulder taping and the application of counter-traction. Brachial plexus stretch upon neck extension for optimal surgical access and visualization was second in frequency-of-occurrence. Evolving traction injury to the ulnar nerve attributed to tightly-wrapped or malpositioned arms was observed in 16% of alerted cases, whereas evolving spinal cord injury following neck extension accounted for an additional 19%. This study highlights the role of tceMEP and ulnar nerve SSEP monitoring for detecting emerging peripheral nerve injury secondary to positioning in preparation for and during anterior cervical spine surgery.